Built by Dutch colonialists in the 17th century, the Castle of Good Hope originally overlooked the Cape Town shoreline. Land reclamation efforts mean that it’s now located nearly two kilometers from the sea, near the city’s historic Bo-Kaap neighborhood and the District Six Museum. 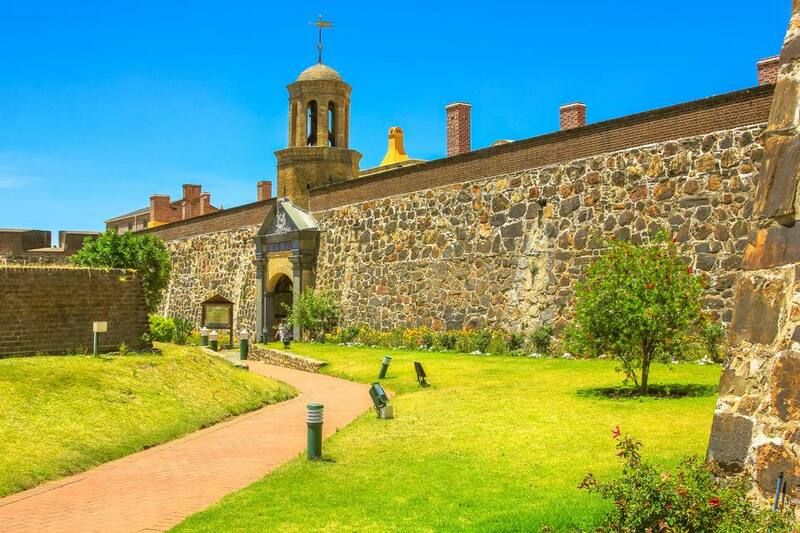 It remains one of the world’s best preserved examples of a Dutch East India Company (VOC) fort and is the oldest surviving colonial building in South Africa. Built in the shape of a pentagon with a bastion at each of its five points, the castle was declared a national monument in 1936 in recognition of its two-century role as a political and military stronghold. For visitors to Cape Town, it provides a fascinating insight into life in the early Cape Colony. The Castle of Good Hope was not the first fort to be built on the Cape. That title belonged to the Fort de Goede Hoop, built immediately after the arrival of Jan van Riebeeck (the first Commander of the Dutch Cape Colony) in 1652. However, the original fort was constructed out of clay and timber and suffered major structural issues. In 1664, rumors of an impending war between the British and the Dutch led to the commissioning of a stronger stone castle on the Cape — the Castle of Good Hope. Building began in 1666 under the supervision of van Riebeeck’s successor, Zacharias Wagenaer, and was completed in 1679. Materials were sourced locally and included granite from nearby Signal Hill and slate and shells from Robben Island. The workforce was an eclectic mix of sailors, soldiers, Khoi prisoners and slaves. By the time the castle was finished, it was its own community complete with a chapel, bakery, workshops, prison cells and living quarters for members of the military and civilian burghers. Many additions were made over the years, including a bell tower and the Kat: a defensive wall built across the castle’s inner courtyard. The castle served as the seat of government for the VOC until the British took over the Cape Colony in 1795. The British used it as the official Governor's residence throughout the first half of the 19th century and it doubled as a prison during the Second Boer War. Today it is the local headquarters of the South African National Defence Force; and yet, despite its long military history, it has never been attacked. The present-day castle houses two museums, a ceramic exhibition and the ceremonial facilities of the traditional Cape Regiments. Of particular interest is the William Fehr Collection, which exhibits historic Cape furniture and decorative arts in addition to some magnificent oil paintings. The latter depict local people and landscapes from the time of the VOC to the end of the 19th century. History buffs will also appreciate the artifacts on display at the Military Museum, which tell the story of the castle as a defensive stronghold from the 17th to the 19th century. You can visit the castle bakery and a replica forge; and next to the chapel you will find the Krotoa Memorial, dedicated to the first Khoi woman to appear by name in early colonial records. The castle is also full of architectural points of interest. Make sure to look above the main gateway for the emblazoned coat-of-arms of the United Netherlands as well as the six Dutch cities in which the VOC had chambers. Judicial sentences and public announcements were historically delivered from the Kat Balcony, which boasts slender columns, wrought-iron railings and a pediment bas-relief by famous German sculptor Anton Anrieth. The castle’s Dolphin Pool is named for the beautiful dolphin fountain at its center. Try to time your visit to coincide with one of the castle’s traditional ceremonies. The Key Ceremony takes place from Monday to Friday at 10 a.m. and midday, and replicates the ceremonial unlocking of the Van der Stel entrance by the fort’s uniformed guards. Additionally, the Cannon Association of South Africa fires the signal cannon three times a day (at 10 a.m., 11 a.m. and midday, every day except Sunday). This cannon was once used to warn the castle's inhabitants of a ship sighted out at sea. Both ceremonies are weather dependent. Guided tours are offered five times a day (at 11 a.m., midday, 2 p.m., 3 p.m. and 4:00 p.m.). There’s a gift shop on-site, while Re5 Restaurant serves light bites inspired by the region’s African, Dutch, English and Cape Malay culinary cultures. The Castle of Good Hope is open from 9 a.m. to 5 p.m. every day except Christmas Day and New Year’s Day. Entry costs R50 for adults and R25 for children and South African pensioners.